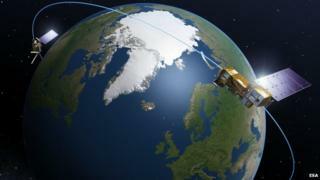 UK engineers will build one of the key instruments on Europe's next-generation polar-orbiting weather satellites. The European Space Agency has engaged Astrium UK to make a follow-on to the Microwave Humidity Sounder (MHS), which feeds data into multi-day forecasts. Up to three units will be purchased, which would value the business at £135m (155m euros). The new instrument, to be known as the MicroWave Sounder (MWS), will have significantly improved performance. Science Minister David Willetts announced the deal at the UK Space Conference in Glasgow. MWS will measure the temperature and water content sitting at different altitudes, in clear or cloudy skies. It is fundamental information needed by the computer models that look at what the weather is likely to be several days ahead. Forecast skill in this area has seen marked improvement over time, with the three-day forecast as good now as the 24-hour prediction was 30 years ago. The current MHS instrument was designed for the Metop series of spacecraft. The first of these satellites, Metop-A, was launched in 2006; a second platform, Metop-B, was sent up last year; and a third, Metop-C, is due to go into orbit in about 2018. But such is the long lead-in time required to design and build meteorological satellites that Esa has already started the procurement of the replacement series, for operation in the 2020s and 2030s. This Metop-SG (Second Generation) system will be a multi-billion-pound endeavour, with nations across Europe asked to provide various instrumentation. MWS will be Britain's major contribution. It will do broadly the same as MHS, only better. It will have 24 sensor channels versus the current five. MWS will also incorporate the observations of another Metop first-generation instrument called Amsu (Advanced Microwave Sounding Units A1 and A2), which makes additional temperature profiles of the atmosphere. Three MicroWave Sounders will be produced, with an option for a third instrument likely to be picked up to ensure data continuity deep into the middle of the century. MWS production will be led from Astrium's Portsmouth factory, but key contributions will also come from southwest England companies SEA Ltd and JCR Systems Ltd, the Rutherford Appleton Lab in Oxfordshire, and Queens University in Belfast. "Metop-SG is actually a pair of satellites, and MWS will be an instrument on one of those satellite models," Andy Stroomer, the head of Earth observation at Astrium UK, told BBC News. "Our contract is for two instruments with the possibility for a third; and the figure you see quoted of 155m euros is the value of three instruments. "It's really great news for Portsmouth. We have the heritage from MHS and now we've got the opportunity to carry all that on." The contract award to Astrium also represents part of the "geo-return" due to the UK for promising to invest Metop-SG. As a member state of Esa, Britain has committed £81m (94m euros) to the R&D programme overseen by the Pairs-based agency. This should ensure UK companies get work on other aspects of the spacecraft in addition to the microwave sounders. Overall, Metop-SG will be led from Germany and France. The eventual operation will be managed by Eumetsat, the intergovernmental organisation charged with running Europe's weather platforms.